My brain and fingers were beginning to rebel against all the sewing I've been doing, I needed a break. Don't misunderstand me. I LOVE to sew, it's soothing and satisfying but over the last few weeks I've been doing a lot of it in preparation for the Pajaro Valley Quilt Association annual quilt show next weekend. 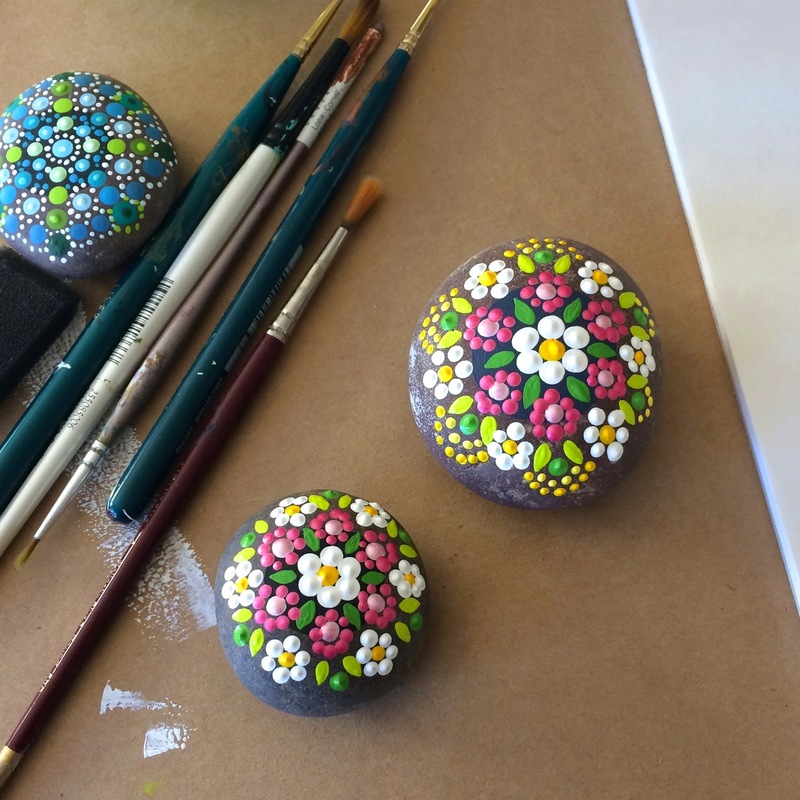 To give myself a change of pace I painted some rocks. I've been really enjoying the opportunity to simply play with color. You can't really tell from this photo, but the best way to paint dots is to use the handle end of various paintbrushes. Just load up some paint and go straight up and down with the brush. I have a few different brushes with different sized handles. 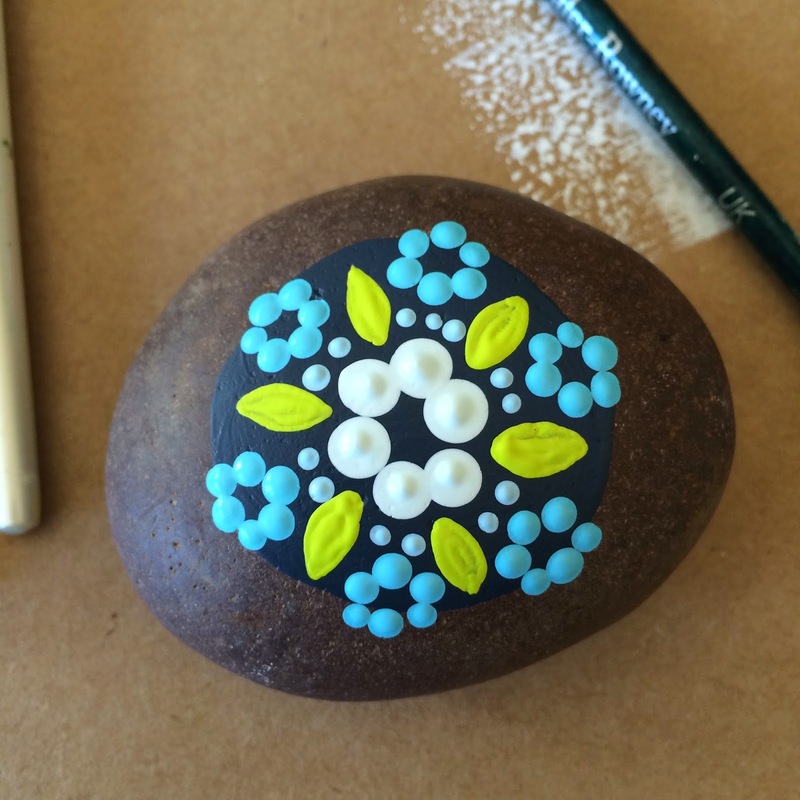 I also use a foam brush handle for really big dots and toothpicks for tiny dots. When I'm finished I plan to give them a coat of varnish to protect them. 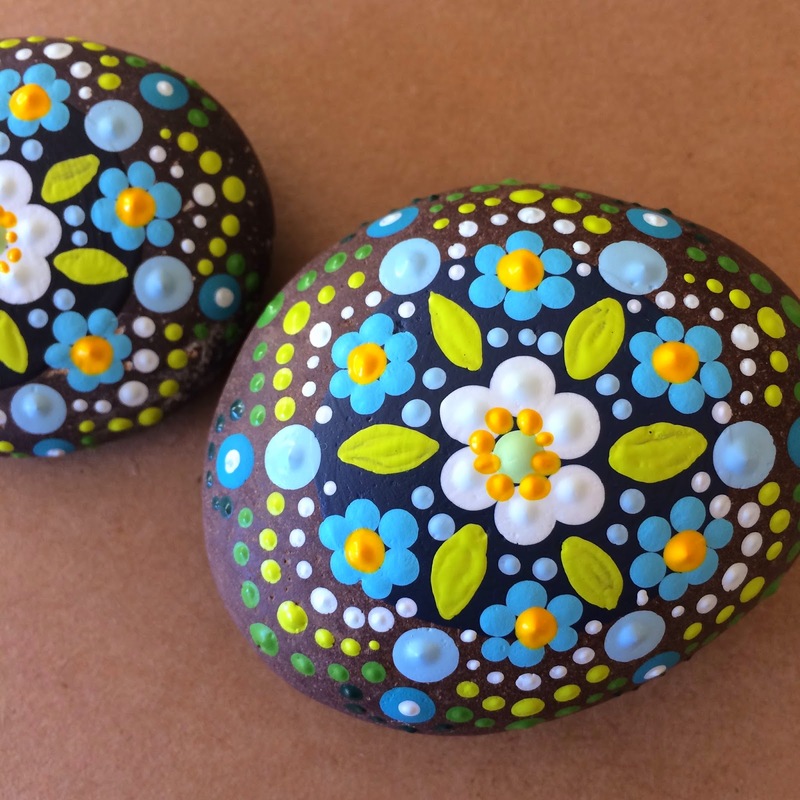 I have used mainly Martha Stewart acrylic paints because they are thicker than the other brands and so the dots on the sides of the rocks don't slump. Some time ago I came across Etsy shop owner Elspeth McLean. 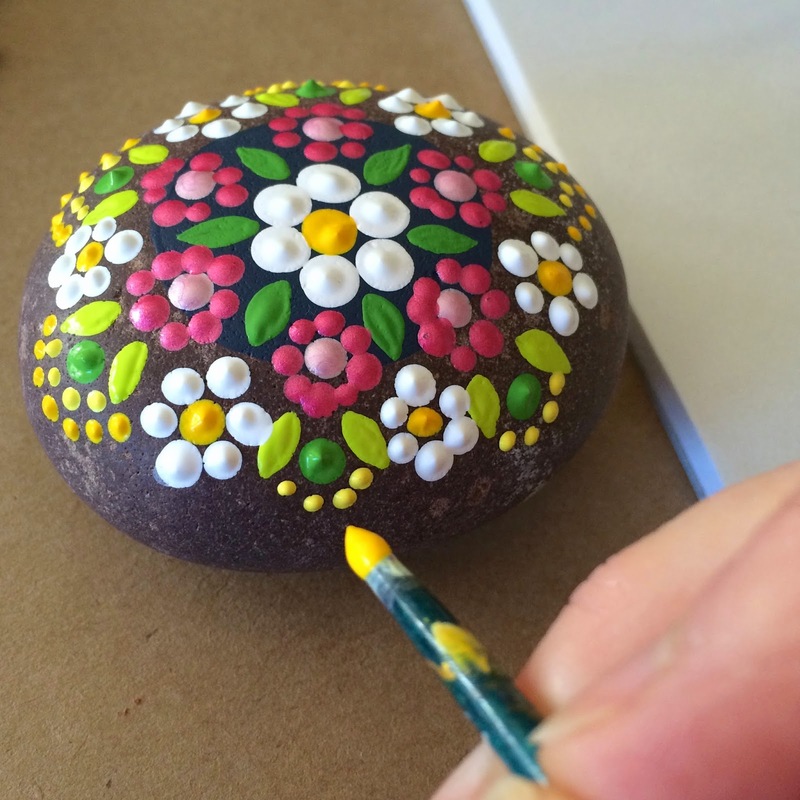 She paints the most amazing mandala rocks. They are so beautiful. Here is a link to her Facebook Page. I have some more that I am painting and will photograph them when I'm done. Ok back to some embroidery! These looks so pretty!! Can you list on the materials needed for this. It is something I would like to start doing but would like to know how much I was have to invest before I get started. Like where did you buy your rocks? Are foam paint brushes easy to find at a Michaels or Joanns? Hi Sarah! I didn't buy anything for these except for some of the paint (be sure to use a thick paint like the Martha Stewart acrylic paints). I had the rocks in my garden and just scrubbed them thoroughly. I think the rocks originally came from Home Depot. The foam brushes are easily found in a Michaels or Joann's and are often on sale. You can also find them at Home Depot. Hope that helps. Yes! Thanks. I can't wait to make some. Hi Vicky! 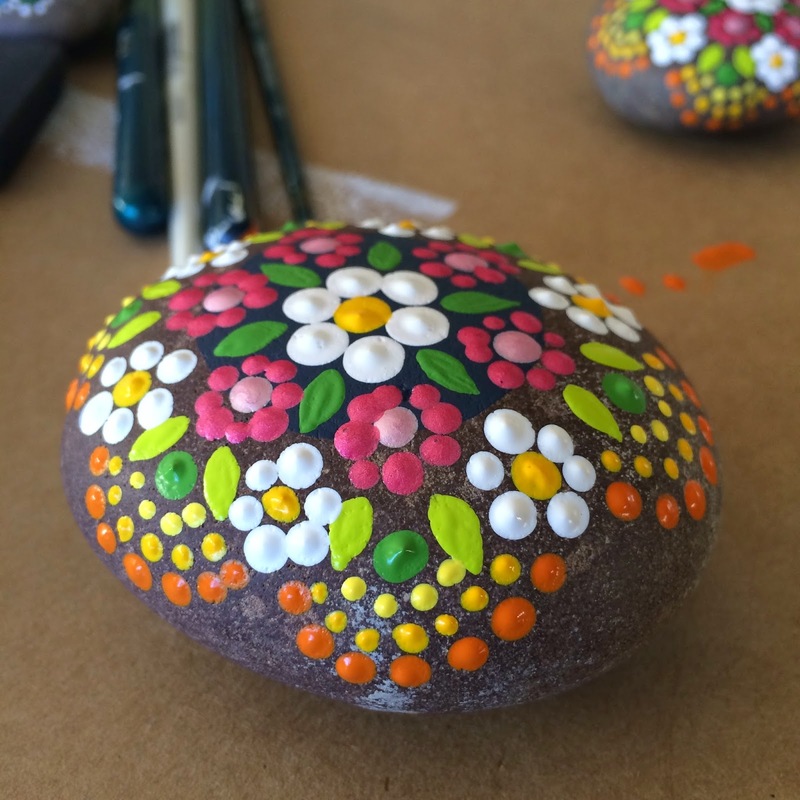 I only use Martha Stewart acrylic craft paint for painting rocks. It is really thick (almost like mayonnaise) and doesn't run or drip which is really helpful on round rocks! I don't recommend using discount store acrylic paint. Martha Stewart paint can be found at most craft stores and online.